Introduction Pulse oximetry is a life-saving tool for identifying children with hypoxaemia and guiding oxygen therapy. This study aimed to evaluate the adoption of oximetry practices in 12 Nigerian hospitals and identify strategies to improve adoption. Methods We conducted a mixed-methods realist evaluation to understand how oximetry was adopted in 12 Nigerian hospitals and why it varied in different contexts. We collected quantitative data on oximetry use (from case notes) and user knowledge (pretraining/post-training tests). We collected qualitative data via focus groups with project nurses (n=12) and interviews with hospital staff (n=11). We used the quantitative data to describe the uptake of oximetry practices. We used mixed methods to explain how hospitals adopted oximetry and why it varied between contexts. Results Between January 2014 and April 2017, 38 525 children (38% aged ≤28 days) were admitted to participating hospitals (23 401 pretraining; 15 124 post-training). Prior to our intervention, 3.3% of children and 2.5% of neonates had oximetry documented on admission. In the 18 months of intervention period, all hospitals improved oximetry practices, typically achieving oximetry coverage on >50% of admitted children after 2–3 months and >90% after 6–12 months. However, oximetry adoption varied in different contexts. We identified key mechanisms that influenced oximetry adoption in particular contexts. Conclusion Pulse oximetry is a simple, life-saving clinical practice, but introducing it into routine clinical practice is challenging. By exploring how oximetry was adopted in different contexts, we identified strategies to enhance institutional adoption of oximetry, which will be relevant for scale-up of oximetry in hospitals globally. Pulse oximetry is a cost-effective clinical tool that could prevent more than 150 000 child pneumonia deaths annually if it were more available in hospitals globally. Currently, there are no data evaluating how to introduce oximetry to hospitals where it is not yet available. Our study demonstrated successful institutional adoption of oximetry, revealing new lessons about how oximetry practices are adopted and how to promote oximetry more effectively. Oximetry can be successfully introduced into routine paediatric and neonatal care, but it requires organisational and individual behaviour change. We propose practical strategies that clinicians, managers and policy makers in low-resource settings can use to accelerate the scale-up of oximetry. We conducted this evaluation to better understand how our intervention influenced oximetry adoption, and to inform future efforts to scale up oximetry in Nigeria and globally. Specifically, we aimed to understand (1) whether our oximetry intervention worked (and to what extent), (2) how healthcare workers (and hospitals) adopt oximetry practices, and (3) why the pattern of adoption varies under different circumstances. The Nigeria Oxygen Implementation project evaluation includes quantitative impact evaluation, process and technical evaluations, and mixed-methods assessment of programme theories using realist evaluation.21 This paper focuses on a realist evaluation of oximetry adoption in the 12 participating hospitals. We used realist evaluation to enable a nuanced exploration of how our intervention changed oximetry behaviour and why this may have varied between different hospital contexts. Realist evaluation is a theory-based approach to evaluation that seeks to understand the ‘mechanisms’ through which an intervention generates an outcome in a particular context—‘what works, how, why, for whom, to what extent and in what circumstances’.22 23 By definition, mechanisms are causal processes (ie, responses to the intervention and/or participants’ resources) that are only activated in particular contexts (thus described as the realist principle of generative causation).22 24 The realist approach is particularly useful in the evaluation of complex interventions (like a multifaceted oxygen project),23 25 which typically work through multiple mechanisms and are influenced by a range of contextual factors (including social systems and structures). We conducted this study in 12 secondary-level hospitals in seven urban areas of south-west Nigeria between 1 January 2014 and 30 April 2017 (which coincided with a national economic recession26). These hospitals included government and mission hospitals of varying sizes, selected to be representative of secondary health facilities that admitted children.12 21 Hospitals were typically fee-paying, staffed by doctors and nurses (variable paediatric expertise), well stocked with medications but had poor power supply and oxygen availability (table 1, additional details in online supplementary appendix 1). We introduced oximetry to all 12 hospitals in October–November 2015, as part of a stepped-wedge field trial seeking to improve access to and use of oxygen for children and neonates.21 We provided all hospitals with handheld pulse oximeters (Lifebox Foundation9) for use in their paediatric and neonatal wards. We conducted basic oximetry training for nursing and medical staff based on WHO guidelines27 28 using a brief (~1 hour) task-based teaching module with instructional video.29 Over the following 18 months, all hospitals received quarterly supervisory visits from the central project team, were encouraged to develop local multidisciplinary quality improvement teams and had access to an on-site project nurse for practical support. In addition, hospitals were randomised to receive an improved oxygen delivery system sometime over the subsequent 16 months (clusters of three hospitals, every 4 months). The improved oxygen system involved installation of concentrator-based oxygen delivery systems, technician training, and additional training for medical and nursing staff on the clinical use of oxygen.21 To encourage local ownership, we trained a small group of nurses and doctors (recommended by senior staff) as ‘master trainers’, then supervised them to run multiple half-day training sessions for colleagues (and encouraged them to lead periodic retraining). The first stage of our evaluation involved the identification of programme theories to explore, and articulation of potential context (C), mechanism (M) and outcome (O) configurations. For this, we reviewed the theories (and CMO configurations) identified in our realist review,13 and revisited the theoretical frameworks that informed our intervention (Social Cognitive Theory,30 Theoretical Domains Framework,20 COM-B Behaviour Change Wheel31), innovation adoption32 33 and organisational change management34 (also using these substantive theories to frame our discussion). We began the process of theory identification and CMO articulation prior to the intervention, and revised it continuously throughout the subsequent stages. Our initial list of potential theories was broad and imprecise (online supplementary appendix 2). From this, we prioritised particular theories for testing based on their perceived explanatory importance and their likely implications for future scale-up (with priorities changing as different perspectives emerged from data collection). The second stage of our evaluation involved obtaining quantitative data on (1) oximetry practices and (2) user knowledge. Trained project nurses extracted data from the case notes of all children (aged <15 years) admitted to the hospitals during the study period using a standardised data collection form. We collected data on demographics, clinical presentation, assessment and management (including detailed data on oximetry and oxygen use). For a limited period of time, admitting nurses completed a supplemental nurse oximetry form recording their experience performing oximetry on individual patients (including problems encountered, time taken). We administered knowledge tests to all participants at the training workshops (pretraining and post-training). Knowledge tests included 12 true/false questions about oximetry (scored out of 12) and 5 best-choice scenarios that required interpretation of oximetry results (scored out of 20) (online supplementary appendix 3). We collected data on oximetry practices continuously throughout the study period, using summary results to repeatedly test programme theories and guide future lines of enquiry. The third stage of our evaluation involved obtaining qualitative data on the (1) attitudes, beliefs and behaviours of users in relation to oximetry over time, and (2) user perspectives on how oximetry was adopted as a routine care practice (or not) in their hospital, and why this might have varied between different hospitals. We collected these data from two sources. First, we conducted focus groups with the 12 project nurses who were employed by our project team and embedded within participating hospitals. Project nurses were responsible for on-site data collection and general project support, giving them a unique observational perspective on how oximetry was adopted. We intentionally brought project nurses from different hospitals together to encourage deeper reflection on how causal mechanisms operated in different contexts to generate change in oximetry practice. Second, we interviewed 11 individual nurses and doctors from hospitals that we had identified as outliers (ie, preliminary data suggested they were relatively fast or slow adopters of oximetry practices) to clarify and explore ideas from the focus groups and understand how causal mechanisms were operating within particular contexts. We allowed for additional recruitment of interviewees if necessary to further refine programme theories. A trained interviewer (HRG) facilitated the focus groups (in a private, non-hospital location) and individual interviews (in private offices at the respective hospitals), with a local assistant (AAB) in English (all participants were fluent in spoken and written English). Participants were recruited by the project manager (AAB), provided with written project information and gave written consent. We used a pilot-tested interview guide (online supplementary appendix 4) asking participants to recount experiences of oximetry introduction and adoption (or non-adoption) in relation to context.35 Our semistructured approach enabled us to articulate elements of our programme theory (existing and emergent) as they were raised, and facilitate discussion about how these played out in different contexts. We adjusted our approach between and during focus groups and interviews as our focus shifted from theory identification to theory refinement, recognising when we reached data saturation on some topics and ensuring we fully explored ideas and perspectives from different participants. We made audio-recordings and field notes of all interviews and focus groups, and returned transcripts to participants for comment and correction. We collected qualitative data in December 2016 (during our intervention period). We followed an embedded approach to data analysis.36 We used quantitative data on oximetry practices to describe the pattern of oximetry adoption in participating hospitals over time (including variation between hospitals), and qualitative data (and other quantitative data) to explore the reasons behind this pattern of adoption—how and why oximetry practices changed under different circumstances. We triangulated inferences from the qualitative data with the quantitative data and additional field notes. We used EpiData (EpiData Association, Odense, Denmark) for data entry and Stata V.12 for data cleaning and analysis. We calculated summary measures relating to oximetry practices and knowledge. We used linear regression to analyse the determinants of oximetry knowledge scores. We used logistic regression to analyse the determinants of success versus failure of oximetry attempts. To prevent contamination we nominated the month that an intervention was commenced in each hospital as a washout period, excluding these observations from analysis. We used NVivo V.11 Pro (QSR International, Doncaster, Australia) to code and analyse the qualitative data. We used both inductive and deductive coding techniques, enabling us to explore potential mechanisms and influences we had already identified and to identify new themes emerging from the data. Two investigators (HRG, AG) performed initial data coding, and we used an iterative approach to identify, check and clarify emerging codes and themes, structuring them around the realist CMO framework. We used an iterative approach to analysis, repeatedly reviewing and refining our programme theories using emerging data. For example, we used preliminary data on oximetry use (stage 2) to refine theories from our initial review (stage 1), and clarify questions for focus groups (stage 3). We then used data from the first focus group to further ascertain and refine theories, and identify new lines of questioning for the second focus group and areas that needed particular enquiry in interviews. We then explored the qualitative data more systematically, repeatedly testing inferences using additional data on oximetry use (stage 2) and supplementary field notes. In our initial analysis we explored CMO configurations in each hospital (and individual ward), before constructing more generalisable ‘middle-range theories’ (data-derived concepts that are both sufficiently abstract to hold generally true and sufficiently concrete to be verifiable37). These middle-range theories were reviewed by the authorship group, alongside summaries of the coded qualitative data and summaries of the quantitative data, and repeatedly questioned, retested with the data and revised to reach agreement. We followed the recommended reporting guidelines for realist evaluation (RAMESES II)38 and qualitative (Consolidated Criteria for Reporting Qualitative Research)39 studies. During the study period, 38 525 children were admitted to the participating hospitals, including 13 740 (35.7%) neonates (aged <28 days) (table 2). We obtained completed nurse oximetry forms for 2806 admissions. Approximately 900 healthcare workers attended oximetry or full oxygen training, and we obtained 740 completed pretraining tests and 633 post-training tests (19% missing/incomplete) (table 3). We conducted two focus groups with all 12 of the project nurses and interviewed 11 individual hospital staff (8 nurses, 3 doctors) purposively sampled from selected ‘outlier’ hospitals (table 4). We had no loss of participants following enrolment, and participant review of transcripts confirmed that they accurately reflected the conversations. Prior to our introduction of oximetry, 2.5% (218/8799) of neonates and 3.3% (481/14 602) of children had oximetry documented on admission—84% of readings were from a single mission hospital (H6) (table 2). Oximetry documentation increased to 68% (1829/2681) of neonates and 65% (4039/6175) of children following introduction of oximetry, and 94% (2122/2260) and 95% (3824/4008) following introduction of the full oxygen system. While all hospitals improved oximetry use within 2–3 months (reaching >50% of admissions), hospitals were more variable in reaching and sustaining high (>90%) levels of oximetry use (table 2, figure 1). For simplicity of reporting, we categorised hospitals as ‘fast’, ‘medium’ or ‘slow’ adopters based on their relative performance in achieving and sustaining high levels of oximetry use (table 1). Pulse oximetry adoption: proportion of children and neonates with pulse oximetry documented on admission in 12 secondary-level hospitals in south-west Nigeria (May 2015–April 2017) showing the timing of introduction of pulse oximetry (POx) and full oxygen system (Full O2) for each group of hospitals. Five state hospitals (H4, H7, H8, H9, H12) were closed due to industrial action between 1 June and 10 August 2016. Middle-range theories: how was oximetry adopted? This theory posits that in the context of relative user naivety regarding oximetry (C), increased skills and self-efficacy (M) are important in increasing oximetry use (O), but are largely mediated by attitudinal change (see next theory) (figure 2). CMO configuration: knowledge, skills and attitudinal change. COM, context, outcome and mechanism; POx, pulse oximetry. Prior to our intervention, three hospitals (H5, H6, H11) had pulse oximeters in paediatric areas and two hospitals were doing oximetry semiregularly (H6, H11) (table 1). No hospitals had guidelines relating to the use of oximetry or oxygen. No hospitals included oximetry on nursing observation charts. Interview participants reported that, while some doctors were familiar with oximetry, it was a fundamentally new practice for almost all nurses. They described being ignorant about the importance of oximetry and reported radical changes in people’s attitude and motivation as they acquired knowledge—particularly following the full oxygen training. Quantitative test scores support these qualitative observations. Baseline oximetry knowledge scores were low (table 3); multiple regression analysis revealed greater improvement following the full oxygen training. Analysis of interhospital variation in oximetry test scores following oximetry training revealed a possible small association with oximetry practice: H2, H9 and H12 scored comparatively low and were average (H2, H12) or relatively slow (H9) adopters; H6 scored comparatively high and was the only hospital already routinely using oximetry. However, practice change was achieved successfully in all hospitals irrespective of test scores, suggesting that in a context of low oximetry experience, enhanced knowledge and skills are necessary, but not sufficient, to induce and sustain practice change. This theory posits that in the context of low job satisfaction and motivation (C) and relative oximetry naivety (C), attitudes and beliefs about oximetry need to shift (M) before oximetry changes can be achieved and sustained (O) (figure 2). Nurses responded to the introduction of oximetry to hospitals with mixed feelings. While some nurses were excited about the possibility of this new technology, most felt it was an additional burden to their already busy workload. Some nurses expressed negative feelings about the imposition of this new practice from perceived outsiders and felt they should be reimbursed for extra work (especially if their salaries were already overdue). Despite widespread reservations about oximetry over the first few months, most hospitals showed substantial improvement in oximetry practices (figure 1). However, until hospitals achieved widespread attitudinal change, oximetry practices remained fragile and easily set back by events such as the relocation of a single key person (eg, H8, March 2016) or industrial action (eg, H7, H8, H9, H12, July 2016). Participants reported that early behaviour change required consistent external motivation (eg, reminders from senior staff and visits by project team) to overcome the strong negative attitudes and misconceptions. However, as nurses gained experience using oximetry, they also gained appreciation for the role of oximetry, confidence in using oximetry and motivation to do oximetry routinely. Nurses came to view oximetry as a practice that ‘made their work easier’, giving them greater confidence in assessing and monitoring sick children. Oximetry became accepted as an essential part of routine clinical care (and described by nurses as ‘the fourth vital sign’, alongside temperature, heart rate and respiratory rate) that was done automatically. Acceptance was a gradual process, but some nurses recalled specific incidents that accelerated change, reporting that the biggest motivation to continue oximetry was seeing it makes a difference to patients. Conversely, oximetry without access to oxygen could be demotivating. Indeed, while all participating hospitals had major oxygen access issues, two hospitals (H9, H12) had zero access to oxygen for children. These two hospitals struggled the most to adopt oximetry prior to improvement of their oxygen systems and showed rapid improvement afterwards. While these hospitals were not the only to show this pattern of improvement, they were unique in attributing it to oxygen access. With experience, nurses came to value oximetry as a technical tool (accurate hypoxaemia measurement) and a clinical decision-making aid (guiding oxygen therapy). In addition, many nurses recognised oximetry’s broader value to nursing care (eg, monitoring and early detection of problems), communication and education (eg, to explain to family members and colleagues), and workload (eg, provide heart rate without palpation). Participants identified excessive workload, inadequate staffing and lack of time as the major barriers to routinely performing oximetry on patients. However, quantitative data show little correlation between staffing, admission rates or relative workload (admissions per nurse). The fastest adopters included a large and busy mission hospital (H1), a well-staffed medium-sized government hospital (H3) and a minimally staffed small mission hospital (H11). The slowest adopters included two large and busy government hospitals (H4, H7), and a small but well-staffed government hospital (H12). When oximetry was attempted, it was successful 98.7% of the time and usually took less than 2 min (table 5). However, failure was more likely in neonates (especially if preterm/small, adjusted OR (aOR) 5.88, 95% CI 0.72 to 48.28) and those who were ‘very agitated’ (child: aOR 23.7, 95% CI 9.19 to 61.11; neonate: aOR 18.5, 95% CI 1.53 to 223.7). Participants reported that technical difficulties (eg, the challenge of getting accurate readings on uncooperative children) were frustrating and demotivating, suggesting the need for both adequate patient load to practise and become proficient and adequate time to help troubleshoot and help nurses acquire this new skill. The perceived ‘burden’ of oximetry may relate more to an expression of general overwork and underappreciation—where oximetry was one extra task that nurses were being asked to do without recompense. This was more evident in government hospitals, where many people had not been paid their salary for more than 3 months and were feeling the impact of economic recession. Government hospitals tended to adopt oximetry more slowly than mission hospitals, and oximetry practices regressed in several of these hospitals following industrial action (and facility closure) in June–July 2016 (most noticeably in two smaller state hospitals: H9, H12). This theory posits that when particular influential members of the healthcare team (C) are supported to teach colleagues about oximetry using task-based participatory methods (I), other staff are more easily convinced (M) and supported (M) to adopt oximetry practices (O) (figure 3). CMO configuration: training for behaviour change. CMO, context, mechanism, outcome; POx, pulse oximetry. Participants reported that some training strategies were more effective in promoting behaviour change than others (box 1). First, the supervised training by local trainers enabled key influencers (particularly the head nurses) to acquire the knowledge, skill and motivation to use pulse oximeters effectively—then immediately demonstrate and reinforce these by training their junior colleagues while support was readily available. Second, participants described the need for “thorough sensitisation”, which addressed why oximetry was important and convinced users of the benefits (not simply taught them how to use a pulse oximeter or what they should be using it for). This reportedly enabled learners to embrace change and feel ownership. However, nurses from hospitals (H9, H12) that had zero access to oxygen for children reported that oximetry without oxygen was purposeless, and felt like they were “testing in vain”. Third, the use of active learning techniques in a supportive team environment helped learners willingly embrace change to their beliefs and practice without humiliation or punishment. This theory posits that when particular influential members of the healthcare team (C) are involved and given responsibility for oximetry implementation (I) in a supportive work environment (C), they provide practical support (M) and a modelled example (M) of oximetry use to colleagues, leading to enhanced adoption (O) (figure 4). CMO configuration: leadership style and key influencers, ‘carry me along’. CMO, context, mechanism, outcome; POx, pulse oximetry. Participants reported the importance of ‘carrying along’ those with influence, particularly the head nurse on each ward. Where this was done well, these people became change makers, with the power, responsibility and motivation to enable their team to embrace oximetry as a valuable addition to their basic standard of care. Where the person of influence was not ‘carried along’, they frequently became the major obstacle to others using oximetry, and oximetry practices remained very poor. Being ‘carried along’ meant more than just token involvement (although formal recognition and respect of authority was important). Being ‘carried along’ implied meaningful involvement in the implementation process, giving senior healthcare providers the skills and motivation to carry others along. This required project managers to impart responsibility and ownership to local leaders, while continuing to provide supervision and practical advice in a supportive and collegial way. Participants emphasised that the style of engagement was paramount, requiring positive encouragement rather than a punitive approach. When senior doctors and nurses committed to working together, oximetry became a shared team activity that was valued, and would be done, by doctors and nurses alike. When senior nurses were not carried along, oximetry could become a source of tension between medical and nursing staff and result in nobody accepting responsibility for oximetry. Pulse oximetry is a simple clinical practice using a simple technological device. However, adoption of oximetry by individuals and institutions is far more complex. We had the unique opportunity to evaluate the introduction of oximetry practices in a (almost) naïve environment. 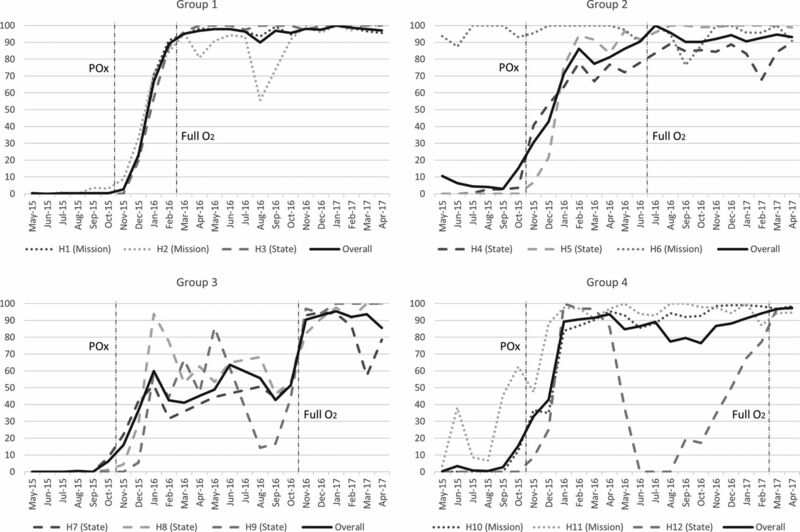 We observed relatively rapid adoption of oximetry practices, achieving coverage levels very close to 100% of admissions—substantially higher than has been reported in other projects.17–19 However, progress varied between hospitals and over time, and our realist evaluation revealed important lessons about how individual and institutional adoption of oximetry can be facilitated. We focus here on the implications for leaders and implementers at the hospital level, and seek to connect our key recommendations with existing behaviour change and innovation adoption frameworks. First, many adoption-innovation frameworks emphasise the importance of leadership (both positively and negatively).33 In keeping with other studies, we found that a supportive and collegial leadership style enabled users to more easily modify their beliefs, attitudes and knowledge, and to sustain behaviour change (while punitive or authoritarian approaches resulted only in short-lived change).40 In addition, we found that opinion leaders were more likely to provide positive and supportive leadership if they were actively involved (‘carried along’) in implementation (ie, participatory approach). This is exemplified by the involvement of senior nurses and doctors as ‘master trainers’, whereby they gained modelling of supportive leadership approaches and took on real responsibility (and a prominent role) in the change process. Identifying and harnessing the support of the right influencers is difficult.40 The ‘master trainer’ approach facilitated this by involving multiple potential opinion leaders in a process that enabled the emergence of particular leaders. Second, the introduction of oximetry requires more than the provision of equipment and training. Training is clearly useful, especially if it convinces learners ‘why’ they should change their practices and gives learners practical opportunities to use their newly acquired skills in their own work environment (box 1). Merrill’s41 ‘first principles’ provide a practical approach to this, promoting a task-based active learning approach structured around ‘activation’ (building on prior knowledge), ‘demonstration’ (showing), ‘application’ (practice and feedback) and ‘integration’ (application in their particular context). In addition to good training, healthcare workers also need reminders, encouragement from peers and seniors, and access to practical help as they master the new skill. Key influencers within the organisation are best placed to provide this supervision; however, external project officers may have a role in supporting and building capacity. We found Michie et al’s COM-B framework (and Behaviour Change Wheel31) useful to help leaders think more broadly about how they can stimulate changes in behaviour (B)—by increasing knowledge and skills (C, capability), and by creating a more enabling social and physical environment (O, opportunity) and giving people a compelling reason to act (M, motivation). Communicates ‘why’ learners should change practice, not just ‘what’ they should do, and articulates this as a shared vision that learners can ‘own’. Connects new knowledge and practices with existing knowledge and practices, in an encouraging environment that fosters non-judgemental self-correction. Is hands-on and enhances problem-solving abilities so that learners can understand the real-world application and address particular challenges in the local context. Includes practical application for learners to apply newly acquired knowledge, including ongoing support to re-enforce learning and support the gradual process of change. Involves clinical leaders who will have ongoing influence through supervision, recognising their role, expertise and relationships with other staff. Builds teamwork through joint learning and problem-solving with colleagues. Uses job aids to aid learning and act as ongoing reminders in the clinical workspace. Third, while oximetry has many attributes promoting its adoption (low complexity, high observability), we identified some strategies to boost its attractiveness to potential adoptees.32 Implementers can enhance the relative advantage of oximetry by promoting oximetry as a tool to ‘help healthcare workers do their jobs more easily’. Oximetry helps healthcare workers identify hypoxaemia and guide oxygen therapy, and helps them monitor sick patients, detect clinical deterioration, educate patients and junior staff, and promote positive physical interaction between patients and staff. Even the simple ability to simultaneously assess heart rate using oximetry was appreciated by many nurses. Communicating these broader benefits of oximetry may help overcome initial perceptions of ‘extra work’ (especially as many staff will only be convinced that oximetry is worth the effort after they have tried it and experienced the benefits themselves). Implementers can enhance the compatibility of oximetry by embracing it as an essential vital sign for all admitted children. The WHO currently recommends that oximetry is performed on all patients presenting or admitted with respiratory illness, emergency signs or any sign of hypoxaemia.27 28 This is intended to target the highest risk patients and efficiently allocate scarce resources. However, previous studies that followed these recommendations struggled to attain usage levels above 50% even in the selected population of children with pneumonia.17–19 Our study suggests that the integration of oximetry practices into existing routines and professional identity was a major facilitator to adoption and likely contributed to sustainability. Moreover, we found that oximetry can be embraced as the ‘fourth vital sign’, appreciated as a practice that ‘makes our job easier’ and should not take users excessive time. Finally, while oxygen and oximetry go hand in hand, most hospitals effectively adopted oximetry despite severe oxygen access challenges (even H9 and H12 made considerable progress despite zero oxygen access). Indeed, oximetry may have been particularly valued as it enables more rational use of this scarce resource (an idea we will explore further in our final evaluation). We followed hospitals for 18 months after the introduction of oximetry and cannot report on long-term sustainability yet. However, oximetry has been effectively integrated into routine practice and no longer requires external support. Hospitals have successfully oriented and trained new staff. Hospital technicians have fixed minor equipment problems. Hospital managers have purchased additional pulse oximeters for use in other wards. In Nigeria’s user-pay system, hospitals identified financing to be the greatest threat to sustainability. To address this, hospitals have implemented small-scale oxygen insurance schemes whereby each patient pays a small ‘pulse oximetry’ fee which is used to maintain oximetry and oxygen equipment. Informal feedback suggests that this has been acceptable to patients and has generated adequate finance to cover all maintenance and repair costs (longer term evaluation is planned). Using a mixed-methods realist approach to evaluation enabled a deeper and more nuanced exploration of how oximetry was adopted by focusing our attention on how change occurred and in what contexts. However, it is not possible to explore all possible mechanisms or contexts. We chose to focus on a theory level that would be most practically useful to hospital leaders seeking to introduce oximetry into their own environments. As such, we concentrate on the immediate hospital-level dynamics and do not delve deeply into many of the more specific individual, or broader socioeconomic and cultural factors. The primary researcher (HRG) and interview assistant (AAB) had dual roles as project implementers and interviewers. Most of the staff participating in interviews and focus groups knew the interviewers and could have felt reluctant to criticise the project or their hospital. Postinterview debriefing suggested that respondents valued the opportunity to give feedback in a formal manner, were eager to discuss challenges and give suggestions for improvement, and familiarity with the interviewers helped facilitate discussion. Given the challenges of ‘insider’ researcher status,42 we sought to minimise bias in multiple ways. We framed interviews as an opportunity for us to hear from the ‘experts’, handing story-telling power to participants. The lead researcher made notes during and following interviews, recording his thoughts, questions and emotional reactions. We returned transcripts to participants for correction and feedback. We triangulated quantitative and qualitative data to verify findings. Multiple researchers contributed to coding, including one project ‘outsider’ (AG). The insider–outsider perspective also added value to our study, as interviewers had a wealth of informal feedback and observations that provided a practical understanding of discussions and provided a springboard for deeper exploration of ideas. Our study benefited from a large sample size and minimal missing data. However, quantitative data on nurse’s oximetry experience involved a smaller population that may not have been fully representative of the larger study population. We obtained our qualitative data through focus groups and interviews with front-line users and implementers from 12 hospitals, intentionally selecting participants to capture a broad range of insights into how oximetry was adopted in different contexts. We faced some challenges when piloting our interview guide, as participants struggled to understand proposed programme theories. In response, we modified the interview guide to lead with more concrete questions, and used flexible interviewing techniques to facilitate discussion about the interplay between context, mechanism and outcomes. Our study was conducted as part of a broader field trial and benefited from having dedicated project nurses and external supervision led by a dedicated project manager. However, this approach also had disadvantages as it created a perception that oximetry was being done for research purposes, rather than to help staff and patients, and raised expectations of financial incentives. This undoubtedly contributed to nurses’ perception they were doing extra work for others without personal gain and probably made local ownership harder to achieve. Our findings are from paediatric areas within medium-sized Nigerian hospitals and may be less relevant outside this context. However, poor oximetry practices are common in hospitals throughout the world, particularly in low-income and middle-income countries,12–16 and our realist evaluation approach enables many lessons to be shared. Our study looked specifically at oximetry; however, our findings may be relevant to the introduction of other care practices, particularly those that involve the introduction of new health technologies. Pulse oximetry is a simple, life-saving clinical practice, but introducing it into routine clinical practice is challenging. By exploring how oximetry was adopted in different contexts, we identified strategies to enhance institutional adoption of oximetry, which will be relevant for the scale-up of oximetry in hospitals globally. We thank the staff and management at all the participating hospitals, patients and families, and members of the Nigeria Oxygen Implementation team. We thank Eleanor Neal, Dino Rech and Mariam Tokhi.
. Clinical signs of hypoxaemia in children with acute lower respiratory infection: indicators of oxygen therapy. Int J Tuberc Lung Dis 2001;5:505–10.
. Predictors of hypoxaemia in hospital admissions with acute lower respiratory tract infection in a developing country. Arch Dis Child 1997;76:310–4.
. Clinical predictors of hypoxaemia in Gambian children with acute lower respiratory tract infection: prospective cohort study. BMJ 1999;318:86–91.
. Lifebox: A Global Patient Safety Initiative. A&A Case Reports 2016;6:366–9.
. Utility and feasibility of integrating pulse oximetry into the routine assessment of young infants at primary care clinics in Karachi, Pakistan: a cross-sectional study. BMC Pediatr 2015;15:141.
. Pulse oximetry for children with pneumonia treated as outpatients in rural Malawi. Bull World Health Organ 2016;94:893–902.
. Oxygen for children and newborns in non-tertiary hospitals in South-west Nigeria: A needs assessment. Afr J Med Med Sci 2016;45:31-49.
. Providing oxygen to children in hospitals: a realist review. Bull World Health Organ 2017;95:288–302.
. Oxygen and pulse oximetry in childhood pneumonia: surveys of clinicians and student clinicians in Cambodia. Trop Med Int Health 2014;19:537–44.
. Oxygen and pulse oximetry in childhood pneumonia: a survey of healthcare providers in resource-limited settings. Journal of Tropical Pediatrics 2012;58:389–93.
. Multicenter study of hypoxemia prevalence and quality of oxygen treatment for hospitalized Malawian children. Trans R Soc Trop Med Hyg 2013;107:285–92.
. Improved oxygen systems for childhood pneumonia: a multihospital effectiveness study in Papua New Guinea. Lancet 2008;372:1328–33.
. Oxygen systems in health facilities with limited resources: a trial in Papua New Guinea. University of Melbourne 2008.
. Improved oxygen systems in district hospitals in Lao PDR: a prospective field trial of the impact on outcomes for childhood pneumonia and equipment sustainability. BMJ Open 2017;1.
. Making psychological theory useful for implementing evidence based practice: a consensus approach. Qual Saf Health Care 2005;14:26–33.
. Realistic Evaluation. USA: SAGE Publications, 1997.
. The science of evaluation: a realist manifesto. USA: SAGE, 2013.
. The concept of mechanism from a realist approach: a scoping review to facilitate its operationalization in public health programme evaluation. Implement Sci 2015;10:153.
. Realist complex intervention science: applying realist principles across all phases of the Medical Research Council framework for developing and evaluating complex interventions. Evaluation 2016;22:286–303.
. Nigeria economy and the politics of recession: a critique. Journal of Advances in Economics and Finance 2017;2.
WHO. Oxygen therapy for children. Geneva: World Health Organization, 2016.
WHO. Pocket Book of Hospital care for children: guidelines for the management of common childhood illnesses. 2nd ed. Geneva: World Health Organization, 2013.
. Pulse oximetry & oxygen for children and newborns. 2015. Melbourne, Australia: Aysha Zachariah, 2017. (accessed 24 Nov 2017).
. Social foundations of thought and action: a social cognitive theory: Prentice-Hall, Inc, 1986.
. The behaviour change wheel: a new method for characterising and designing behaviour change interventions. Implement Sci 2011;6:42.
. Diffusion of Innovations. 3rd Edn. Canada: Collier Macmillan, 1983.
. Innovation adoption: a review of theories and constructs. Adm Policy Ment Health 2014;41:480–502.
. Organisational change management: a critical review. 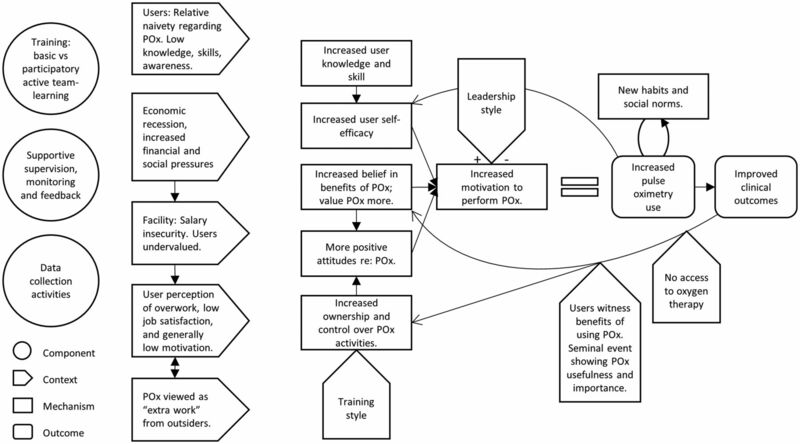 Journal of Change Management 2005;5:369–80.
. The craft of interviewing in realist evaluation. Evaluation 2016;22:342–60.
. Designing and Conducting Mixed Methods Research. Thousand Oaks: Sage 2007.
. Social theory and social structure: free press. 1968.
. RAMESES II reporting standards for realist evaluations. BMC Med 2016;14:96.
. Diffusion of innovations in service organizations: systematic review and recommendations. Milbank Q 2004;82:581–629.
. First Principles of Instruction. In: Reigeluth CM, Carr A, eds. Instructional design theories and models: building a common knowledge base. New York: Routledge Publishers, 2009. Contributors HRG contributed to study conception and design, project planning, interviews, data management and data analysis, and drafted the manuscript. AAB contributed to study design, project planning, interviews, data management and data analysis. AG contributed to study design, data management and data analysis. AIA contributed to study design, project planning and data management. SQ contributed to study design and evaluation planning. BM contributed to study design and data analysis. RI contributed to study conception and design, and project planning. TD contributed to study conception and design, project planning, and data analysis. AGF contributed to study conception and design, project planning, and data management. All authors read and approved the final manuscript. No medical writer or editor was involved in the generation of our manuscript. Funding This work was supported by the Bill and Melinda Gates Foundation (OPP1123577) and the WHO. Neither organisation was involved in the writing of the manuscript or the decision to submit it for publication. The corresponding author had full access to the data and has final responsibility for the decision to submit for publication. Ethics approval Our study was approved by the University of Melbourne Health Sciences Human Ethics Sub-Committee (ID: 1647681.1) and the University of Ibadan/University College Hospital Ibadan Ethics Committee (ID: UI/EC/16/0445). Data sharing statement We will make data created during this research available after completion of final evaluation analyses in December 2018 (including restricted de-identified clinical datasets and data from interviews and focus groups due to privacy and confidentiality requirements).